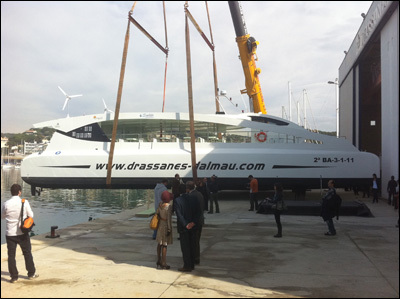 Yesterday morning, at the facilities of Drassanes Dalmau in the port of Arenys de Mar the company celebrated the presentation and Official Launch of the ECO-SLIM, Europe’s largest ecological passenger catamaran built by Drassanes Dalmau and with electric motors that are powered by a solar photovoltaic installation and two mini wind turbines from the Spanish company Zytech Solar. The event was attended by leading industry figures, and the Secretary General of Innovation Juan Tomás Hernani, the Director General of the Merchant Navy María Isabel Durantez , the Secretary of Universities of the Generalitat Antoni Castellà, and the Deputy Director General of Ports and Coastlines of the Generalitat Rosa Maria Busquets among other officials. The official Launch took place in the traditional way by breaking a bottle of Catalan Cava against the ship’s hull. After the launch, the attendees had the chance to get on the boat and take it for a test ride within the port premises. The vessel has a length of 24 meters, a beam of 10.50m and can carry 150 passengers at a maximum speed of 12 knots. The new boat is a big step forward in sustainability in the marine industry both for its lightness and reduced friction, in addition to being powered by renewable energy. In order to reduce its environmental impact, Drassanes Dalmau has enjoyed the support of the Polytechnic University of Catalonia to develop a new propulsion system based on the use of high performance electric motors connected to a power system from multiple sources. The new boat is highly environmentally friendly because it operates from the combination of energy generated by photovoltaic modules, mini wind turbines, hydrogen batteries and thermal generators. In this way it will have a minimum environmental impact on the air and sea while completely eliminating noise pollution. 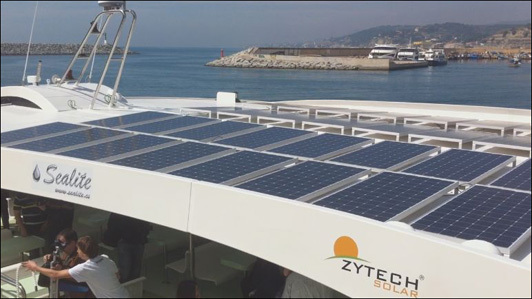 Both the photovoltaic modules and the mini wind turbines are manufactured by Zytech Solar, which has designed, together with Drassanes Dalmau a hybrid installation of 9.5 kW by using 40 Monocrystalline modules and two Lakota wind turbines to power the boat with energy that is clean and abundant in the marine environment. One of the main added values of Zytech Solar products, in addition to their excellent relation quality – price, is their adaptability to all kinds of facilities and great versatility to suit any specific needs, thanks to the flexibility of the company’s manufacturing process. Proof of this is out latest installation performed on an innovative hybrid boat. Zytech Solar, with corporate headquarters in Spain and subsidiaries in Germany, France, Italy, Benelux, USA and China, is a leading manufacturer of photovoltaic modules. The constant obsession for quality and the pursuit of technical innovation of its I + D + i Department ensures long-lasting products and highly efficient systems. Zytech provides technical advice as an added value to all its customers and installers and has a fast and efficient customer service. Zytech Solar belongs to the Zytech Business Group. Zytech Group is an European group of companies with international presence and activity all around the world. Specialised in producing photovoltaic modules, building integrated photovoltaics (BIPV)and off-grid photovoltaic systems, other group companies are dedicated to manufacturing mini wind turbines (Zytech Aerodyne), solar lamps, solar heating equipment and electric vehicles (Zytel). As part of its strategy of diversification within the sector of renewable energy and sustainable transport Zytech devotes significant resources to the investigation of low and high concentration photovoltaic technology and the approval of an electric vehicle with zero-CO2 emissions.